Can you love someone you can never touch?Stella Grant likes to be in control—even though her totally out of control lungs have sent her in and out of the hospital most of her life. At this point, what Stella needs to control most is keeping herself away from anyone or anything that might pass along an infection and jeopardize the possibility of a lung transplant. Six feet apart. No exceptions.The only thing Will Newman wants to be in control of is getting out of this hospital. He couldn’t care less about his treatments, or a fancy new clinical drug trial. Soon, he’ll turn eighteen and then he’ll be able to unplug all these machines and actually go see the world, not just its hospitals.Will’s exactly what Stella needs to stay away from. If he so much as breathes on Stella she could lose her spot on the transplant list. Either one of them could die. The only way to stay alive is to stay apart. But suddenly six feet doesn’t feel like safety. It feels like punishment.What if they could steal back just a little bit of the space their broken lungs have stolen from them? Would five feet apart really be so dangerous if it stops their hearts from breaking too? This. This book is exactly why I adore the Young Adult genre! A charming and captivating story about two teens trying to navigate their way through their lives and their diagnoses. I went into this book blind. I was sent a Netgalley, and only knowing the genre I decided to dive in without knowing what the book was about. I don't know if that heightened my reading experience at all, but what I do know is that I devoured this novel. I could not, and did not, put it down. It followed me to the kitchen, to work, to the gym and to bed until I, sadly, finished it. Do you ever just sigh after finished a book? Almost as if you're releasing a breath you didn't even know you were holding? That's exactly how I felt after finishing Five Feet Apart. Five Feet Apart is told through the perspectives of Stella and Will. Stella, who has Cystic Fibrosis and "enjoying" another stint in the hospital.Her home away from home. She knows every nurse and is a bit of a control freak when it comes to her meds and routines. Will, who has CF and B. Cepacia, is new to this hospital, though he is not new to treatments. His mother flying him all around the world for trial treatments, that have all eventually failed. He now finds himself at Stella's hospital for a new trial. Will is laid back, a little too laid back for Stella, and she quickly wants to reign in control and "help" Will with his medications and wellness regimen. The hitch? Because of their diagnoses, they must remain 6 feet apart, or they'd be at risk for deadly infection. Stella and Will's friendship grows and their relationship blossoms before your eyes. You're given the pleasure of learning who they are individually, and then who they become together. 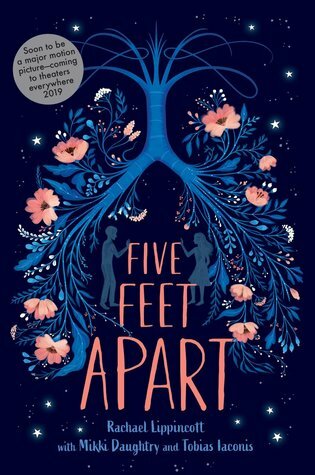 With its beautiful writing and heartfelt storyline Five Feet Apart is not just a story about 2 teenagers. It is a story about growth resilience. It's about Stella and Will learning who they are, beyond their diseases. I cannot wait to see this book come alive on the big screen! Check out the trailer below.